November 6, 2010 marked the 37th year of the Alberta Quarter Horse Breeders Group Fall Sale, held in conjunction with Edmonton Northlands at the Northlands EXPO Center, Edmonton, Alberta. Jerry Kanewischer was on the auction block and Ron Anderson was once again our pedigree commentator. Monogrammed sheets, which were donated by Spruce Grove Feeds and Equistar Veterinary Services, were awarded to both the consignor and the purchaser for the high selling horse in each of the following age categories – graciously sponsored by: Weanling – Alberta Quarter Horse Breeders Group; Yearling – G.W. Equine Services; Two Year Old – Edey Ranches; Three Year Old – Equistar Veterinary Services; Aged – Cross Bell Performance Horses (Ed Wedman). A monogrammed winter blanket was donated by Brian Hunter of the Remax Real Estate Centre to the purchaser of the Overall High Selling Horse of the 2010 Fall Select Sale. Lot # 12 – BOON A BOB (Mr Roan Freckles x Majors Paradise), 2009 Bay Roan Mare consigned by Bob Butz; purchased by Esther Schwab. Lot #14 – GAYLA TJ (High N Wicked x Gayla Roslyn), 2007 Sorrel Gelding consigned by Larry David; purchased by Trevor Marcinek. The Alberta Quarter Horse Breeder’s Group held their Annual General Meeting on the afternoon of November 5, 2010 and was followed by a Wine and Cheese Reception for the group membership and Fall Select Sale consignors. This event was sponsored by Bioniche Animal Health Canada Inc. 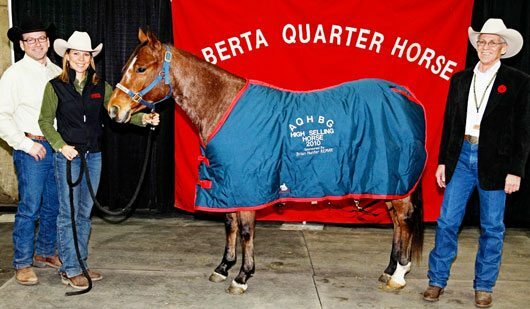 The Alberta Quarter Horse Breeders’ Group would like to thank all who attended the 37th Annual Fall Sale and a special thank you to the sponsors, consignors, and purchasers.